Leafy growth on a tomato plant (Lycopersicon) without flowers or fruit is usually caused by adverse environmental conditions, but diseases, such as, viral diseases can also affect flowering and fruit set. Tomato plants fail to produce fruit when pollination does not occur. Tomatoes have both male and female parts in the same flower but sometimes pollination fails to occur. The result is that the plants may appear to be healthy, growing well, and flowering, but many or all of the blossoms drop from the plant failing to form fruit. Plants grown outdoors are generally self-pollinating as long as there is a breeze or other mechanism for moving pollen from anthers to pistil. Weather conditions are key factors in successful pollination. Daytime temperatures over 90 degrees F. and/or nighttime temperatures below 55 degrees F. will diminish pollination in tomatoes. High humidity creates sticky pollen which does not transfer well. 1. Follow planting guidelines for your time zone. 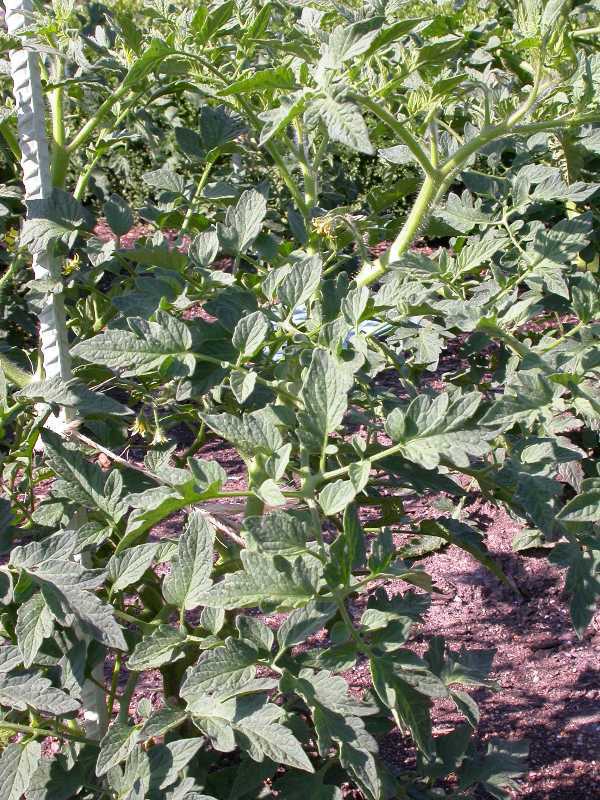 Tomatoes planted too early or too late are more likely to have pollination problems. Early and late varieties may be more fruitful if weather is an issue. 2. Hormone sprays. Use of a blossom set hormone may increase fruit production if the cause is cool, cloudy weather, but not if the temperatures are too high. 3. Provide good culture. Minimize stress on your plants with proper spacing, watering, and pest management. 4. Fertilize properly. Avoid excess nitrogen which will promote foliage growth at the expense of blossom formation. Strategies 1 and 3 are strictly organic approaches. Using an appropriate organic fertilizer would be a viable organic approach to Strategy 4.